To say the least, Nacho Patrol has been hesitant about reviewing pro sports related nacho plates. Exorbitant pricing (which, one must remember, must be added on top of the cost of a ticket to the event), gooey, bag-born cheese, and lackluster showmanship usually situate these feeble attempts at snackery in our “no thanks” column. But the opportunity to be among the first people ever to try a nacho plate at a new venue, let alone to be the first to review it, well that was just too much to pass up. 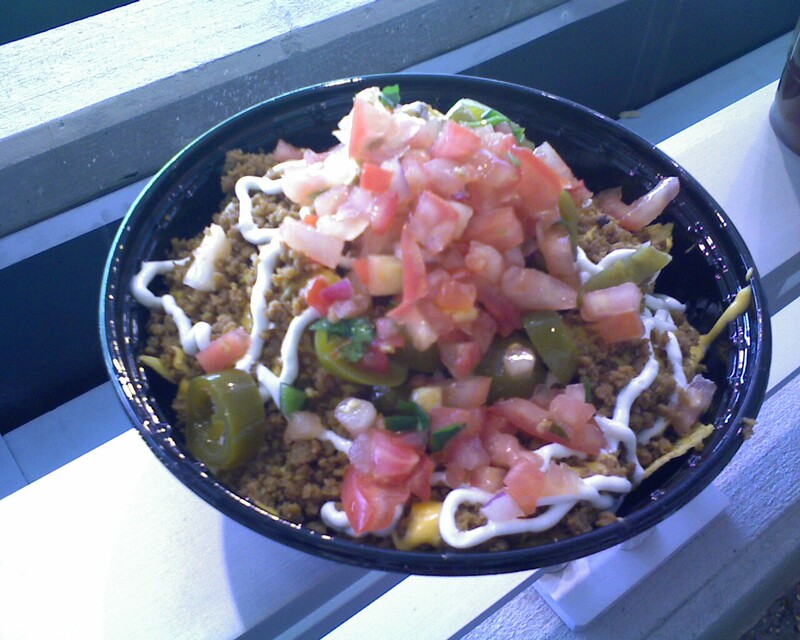 And to be honest, we’re sort of glad, because the Nachos Grande at opening day of the Minnesota Twins’ Target Field were, well, sorta good. Maybe it was the smell of the fresh cut grass wafting into the stands that gave this salty, yellowish pleasure-pile that little something extra. Perhaps it was the sound of Jason Kubel’s bat as it gave a layed-up fastball the bitchslap of a lifetime that made the crunch of each Old Dutch chip just that much more satisfying. In my heart, I’d like to believe that at the very moment we dug into our first bite, Joe Mauer, hesitating for just a moment between pitch calls (as if sensing what was about to happen), looked across that field of dreams and misspent tax-payer dollars, and whispered softly—secretly—into the gentle spring breeze, “Enjoy.” But whatever it was, the fact remains: these were the best nachos we’ve ever eaten at a pro sports event. That’s not saying much (see the now infamous Fenway Incident), but it’s a pretty good start. Appearance: (6) When we were first handed the Nachos Grande, we would have surely given the plate an 8 for appearance. The shear amount of toppings alone was enough to make us want to tear the thing apart on the spot, but the color and textures of the ingredients made it so beautiful that we stayed our hands for closer inspection (and so that we could go buy beer). While the pile was impressive, it was tough to see the chips through all the toppings, and the plastic bowl didn’t help either. The great color and great texture won the plate decent marks despite its aesthetic shortcomings. 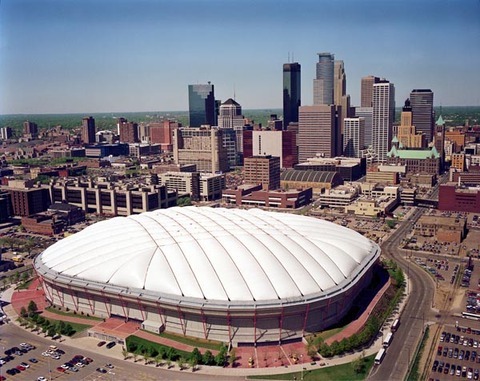 Quality: (7) The food czars of Target Field have seen fit to go further than their Fenway counterparts in nearly every way. The cheese is freshly heated to a liquid state, then ladled, not poured from a bag, onto the layered chips. Atop the cheese is sprinkled spiced ground beef, which both soaks up the cheese and adds texture. And the salsa? Well, let’s just say that there ain’t no Pace Picante up in hur; this is pico-freaking-de gallo, onions and cilantro and all (though the cilantro was a bit chincy). The use of Old Dutch tortilla chips was also much-appreciated for their local character, their satisfying crunch, and their ability to withstand heavy loads of toppings. The high quality of toppings also ensured that each bite retains the same flavor profile, with each ingredient somehow finding its way into almost every bite. Distribution: (7) The Old Dutch chip, a Midwest favorite, is top of the line in the nacho world’s Sporting category: it’s yellow color adds points for Presentation; it’s round shape makes it ideal for both dipping and gripping; it’s curve, much deeper than it’s bleached-out brethrens’, allows for greater cheese flow, boosting the dish’s Distribution score and reducing the number of “crumblies” at the bottom. In addition, because the cheese isn’t simply dumped on the chips from a single, straight down angle, the cheese is able to find its way to every layer. Though the meat, sour cream, salsa and jalapeños are all piled at the tippy top of the heap, its’ easy enough for them to find their way down as you grab for chips from the middle and bottom. Oh, and the sages behind Target Field’s Nachos Grande also saw fit to bestow upon us a tool of indelible nacholy power: the fork. The geniuses over at Fenway still haven’t figured this one out. Trying to eat nachos at a baseball game without a fork is like Nick Punto trying to hit a home run—which is to say, it’s nearly impossible. Price: (4) The only universe in which $8.50 ballpark nachos could ever be considered a “good deal” would have to be one in which a) aforementioned ballpark was brand new and state of the art, b) had just opened, c) thus, freeing the would-be world class baseball team that played there from an inflatable, canvas-covered asylum, and d) where said nachos were enriched by their mere proximity to Joe Mauer and TC the bear. I think you know where I’m going with this. 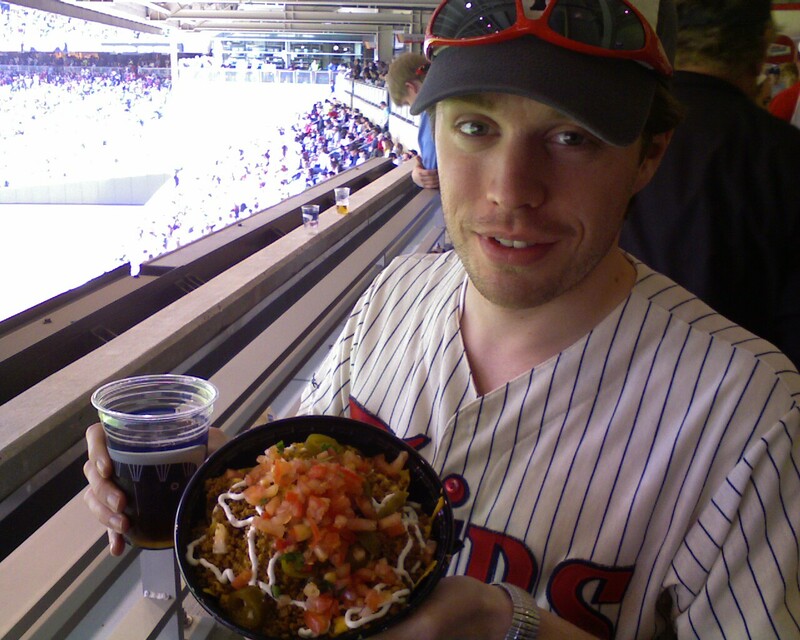 In the end, the stars aligned for Target Field’s Nachos Grande, boosting the plate’s score well above the usual pro sports fair and solidifying it’s place on the stadium concourse of our hearts–a concourse which is shared by porkchops on a stick, honest-to-God pine trees, and Summit beer. Note: This review was written by Trevor M., Twins fan and Boston transplant. Though he doesn’t often slip on his reviewing shoes, he is the sole reason Nacho Patrol exists today. We consider him the Godfather. He knows a cool trick whereby a person can drink a bottle of wine in under a minute. He’s also a keen raver, though he’ll deny it and say he was just drunk. He is also a fellow Minnesotan, which makes him a far superior breed of human being. ← Nachos To-Go: Mystery Solved!